Due to increased traffic on the River Waal (The Netherlands) the local state authority has developed a policy to provide intermediate harbours along the Waal for overnight stay of the ships while on route to their final destination. 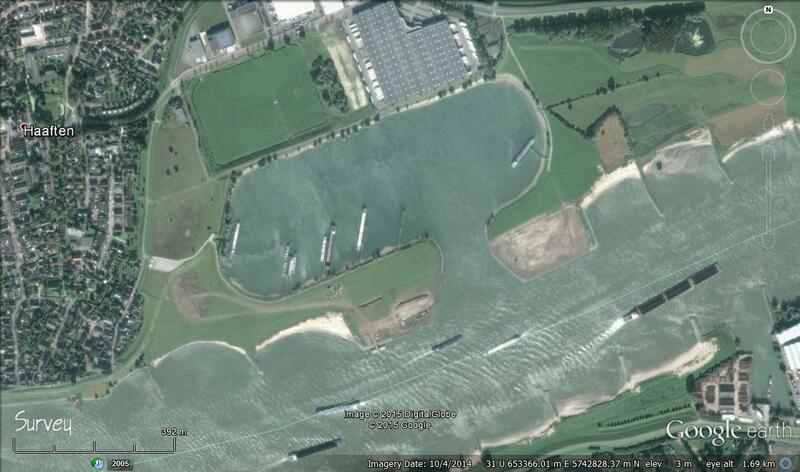 One of these harbours (Figure 1) is located close to the city Haaften in the Netherlands. Following a number of collision accidents in this particular harbour, the authorities considered redesigning the harbour entrance in order to improve accessibility and to ensure ship safety. The suitability of the foreseen changes was evaluated in a recent project by Deltares. This investigation also considered possible sedimentation issues inside the harbor area and along the main channel in front of it, which may result from hydrodynamic and morphological changes that may be caused by altering the harbour entrance. Deltares analysed hydraulic measurement data with a particular emphasis on a year in which a number of incidents with ship/boat collisions near the entrance occurred. In addition, Deltares performed computational modelling with Delft3D in order to evaluate effects of changes in the harbour entrance geometry on the local flow and erosion-sedimentation patterns. With this study we identified the optimal alternative of the harbour entrance. The selected layout provides safe conditions for navigation together with minimal adverse hydrodynamic and morphological effects.